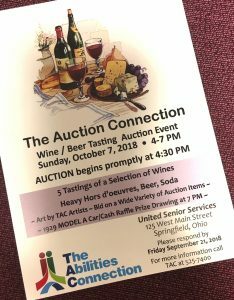 The Auction Connection fundraising event is set Sunday, October 7 at United Senior Services from 4 p.m. – 7 p.m. A few seats for this wine/beer-tasting plus heavy hors-d’oeuvres event are still available. Tickets are $50 each or $85 for a couple. The annual auction is TAC’s largest fundraising event of the year. Parents, caregivers, staff, community business partners and many in the community who care deeply about people with disabilities join together to donate items, money and services to the cause of providing transportation to individuals who come to TAC for employment, connections and care. Tickets are available online: www.bit.ly/TACauction2018 or by calling (937) 525-7488. Credit and debit cards are accepted for payment or auction event attendees may pay at the door. “We have been fortunate this year to have extraordinary donations for the event,” said TAC CEO Justin Debord. Along with collaborative artwork by TAC artists, the auction features a three-wheeled bicycle, a rolling tool chest with tools, and a collection of 25 Ohio Lottery scratch-off tickets. Also up for grabs is a surprise item handcrafted by TAC employees. The drawing for the donated 1929 Ford Model A car or $5,000 cash will take place at the end of the auction at 7 p.m. The winners will be notified by phone or congratulated in person if they are in the audience. Because vehicles are needed at TAC, the car/cash raffle proceeds will be used to purchase a new community inclusion vehicle to transport people with developmental disabilities on outings, to work in the community, and to/from work at TAC. Second prize is $1,000 cash; there will be ten 3rd place tickets drawn for $100 each. PHOTO: TAC employee Tina Ferner holds the Master Gardener’s donation of books, tools, seeds and more. Each auction basket is carefully curated and assembled by Peggy Connolly.